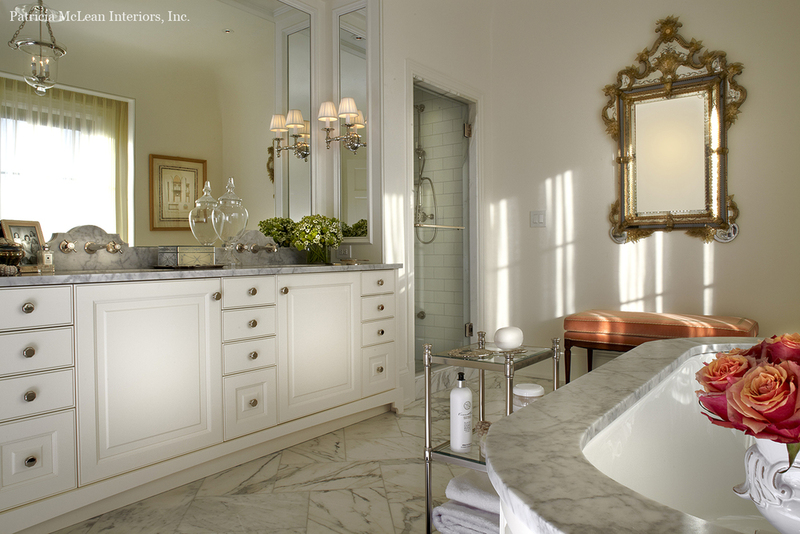 The St. Regis Atlanta Traditional Model Home — Patricia McLean Interiors, Inc. 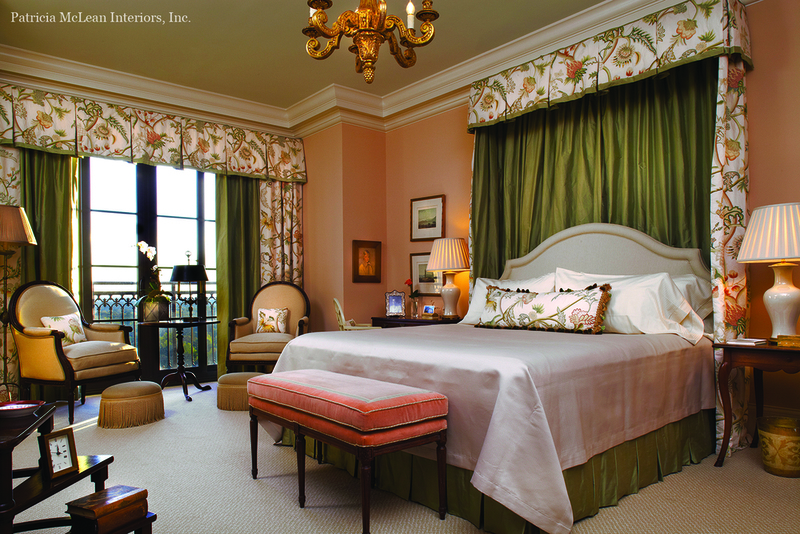 Upon the success of the traditional master bedroom for the 2009 Atlanta Symphony Associates’ Decorators’ Show House, The St. Regis Atlanta Residences hired Patricia McLean Interiors to design a traditional model home residence in 2011. The design of the 4,000 square-foot plan allocates a new paneled study and large master closet while enlarging the master bedroom and reconfiguring the master bath, dining room and guest suite. Marble floors in the entry are custom-designed as is all of the architectural detailing. Every doorway is architecturally enhanced. All the custom paint finishes are hand-mixed by Patricia. The window treatment fabrics include printed cotton, silk, crewel on linen and a woven-with-metallic thread. Silk trims and couture detailing at windows and on furniture are de rigueur. 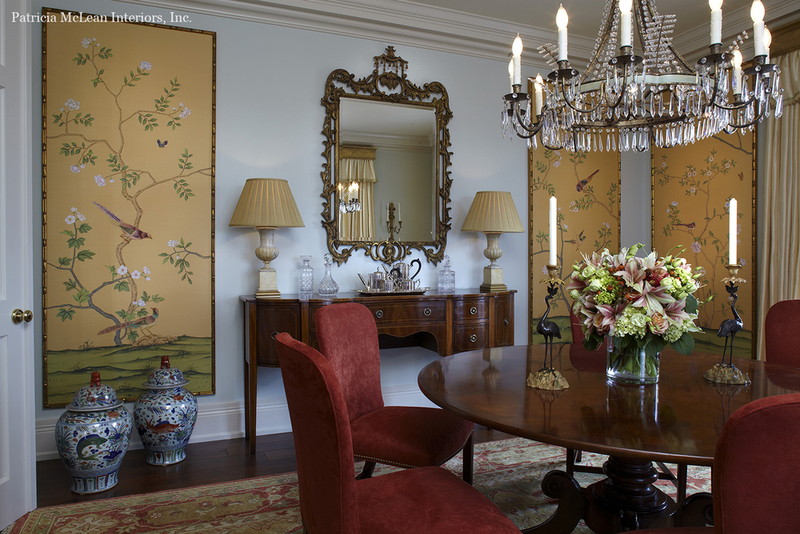 Antiques are a mixture of English, French and Italian with wisps of chinoiserie, a signature integration to schemes. The ten-foot, English-style breakfront is a custom design by Patricia for the living room created by a workshop that produces bespoke pieces she designs. Wool rugs and special art and accessories complete the stunning composition. The residence is highlighted in an article by Betsy Riley in Atlanta Magazine and several real estate blogs.